Meltwater is a social media monitoring SaaS with built-in sentiment analysis capability that measures, tracks and analyzes conversations related to a product or brand. The sentiment analysis feature of Meltwater’s social media monitoring software makes use of Natural Language Processing (NLP) to determine whether the writer of a piece of text or tweet is for or against the topic they are writing about. Meltwater has a database that assigns positive or negative values to words of a text. It assigns a numeric score from -1 to 1 to the overall sentiment of the text. Like other sentiment analysis tools in the market, this tool from Meltwater has its shortcomings such as determining sarcasm in a text or when emojis are used. Meltwater is a commercial software. You can request pricing as well as a demo of the tool. Hootsuite Insights is a social media monitoring tool built for brands and companies who want the capability of real-time monitoring of conversations and sentiments around their brands or products. It is an automated process which makes use of machine learning algorithms to assign a value to the sentiment or feeling behind a mention which could either be positive, negative or neutral. This sentiment analysis tool measures the feelings associated with your product or brand in multiple online sources such as news sites or blogs, and social media such as Twitter and Facebook. Hootsuite provides real-time analysis of data for ease of monitoring feedback on products or campaigns and managing or responding immediately sentiments turn negative. You can sort the results based on gender, location, language, and type of sentiment. You can also see how your brand or product is faring among competitors. Hootsuite Insights comes with a limited free plan but also offers different paid plans depending on the usage and the size of a team. You can also request a demo on their website. Social Mention is a social media monitoring platform that analyzes data in real-time from multiple social media sources such as Twitter, Facebook, FriendFeed, YouTube and Digg, and consolidates them into one place. It is built for monitoring what is being said about brands, companies, and products on social media. Social Mention works with real-time data and measures the sentiment of mentions relating to your product or brand by calculating the ratio of total positive mentions to total negative mentions. One of the salient features of Social Mention is that it provides links to the sources of mentions of your brand or product so that you can view them in real-time. It gives you the option of searching for keywords, videos, blogs, comments, news, and audio across all platforms. Social Mention boasts of monitoring online places for your product mentions that you won’t know exists. Apart from sentiment analysis, Social Mention also provides other analytics such as Strength—which measures the possibility of your brand being discussed online, Passion—which measures the probability of people who are talking about your brand doing so repeatedly, and Reach—which determines the number of unique people who have mentioned your product or brand. Social Mention is available for free and it also comes with an API. Sentiment140 is a sentiment analysis platform that works only with Twitter. It enables you to measure how people feel about your brand, company or product by analyzing their tweets. Sentiment140 makes use of classifiers which are words that are used with machine learning algorithms to determine the class of a word—whether it is negative or positive. It comes with an API which enables you to use Sentiment140 within your website. It is a commercial API and the price starts from $200/month. Trackur Sentiment Analysis Tool is an addition to the Trackur social media monitoring platform which can be used for tracking and monitoring keywords specified by you. It is an automated tool that measures the sentiment of the keyword that you specify within the context of the document in which it is used. It then assigns a value of positive, negative or neutral to the sentiment. Trackur also provides a dashboard that updates the sentiment icons related to the keyword as it changes. Trackur Sentiment Analysis comes with all the paid plans of the Trackur Social Media Monitoring Platform. It also provides an API of its sentiment analysis tool. SAS Sentiment Analysis is an automated sentiment extraction tool that monitors unstructured text data in real-time. Using statistical modeling and rules-based linguistic processing techniques, SAS Sentiment Analysis Tool determines the sentiment of data and assigns it a value of positive, negative, neutral or no sentiment. It also provides an option of monitoring text data over a specific period to be used in a future analysis. SAS Sentiment Analysis Tool provides insights by monitoring your competitors and extracting useful data from social media which can be helpful when planning new strategies. It supports sentiment analysis of texts written in English and support for additional languages are provided as an add-on that is made available upon request. You can request price quotes and a demo of the tool. Open Text Sentiment Analysis Tool is an enterprise level sentiment analysis engine which makes use of machine learning and natural language processing techniques to determine the sentiment of a document. In addition, it evaluates the content of a document to know whether it is factual or subjective. It assigns a value of positive, negative, mixed or neutral to the sentiment. Open Text Sentiment Analysis comes with support for English, French, German, Spanish, and Portuguese. It is also available as an API which empowers you to make full use of the sentiment analysis tool. Analytical tools and visualization widgets are also provided. Clarabridge is a customer experience management platform with built-in sentiment analysis tool. It works with both written and spoken text. This sentiment analysis tool makes use of linguistic processing to analyze words or phrases in order to determine if they are positive or negative. It has the capability of determining the sentiment score of separate phrases and then calculating the overall sentiment of the text. Clarabridge assigns a value of sentiment using an 11-point scale. It can also determine the sentiment of the word being used with reference to the context in which it is being used. With the Clarabridge sentiment analysis tool, you can gather data from multiple of sources such as survey, social media, blogs, and emails, and customize the sentiment of words or phrases being used. You can view a demo of the product. TheySay sentiment analysis API is a scalable, real-time and platform-agnostic API for sentiment analysis. It is a RESTful API that provides access to the Natural Language Processing (NLP) engine. TheySay’s hybrid NLP engine makes use of machine learning classifiers and linguistic algorithms to determine the sentiment of a text. It assigns a value of positive, negative or neutral to the sentiment. A demo of the API and a 30-day free trial are available. NetOwl Sentiment Analysis tool provides entity and aspect-based sentiment analysis. It uses Natural Language Processing (NLP) to determine the sentiment of a text. Sentiment for specific entities can be predefined such as brands, organizations, products, and people. NetOwl takes sentiment analysis even further by providing sentiments of different aspects related to the entities defined. In addition to giving a value of negative and positive to the sentiment, it also makes use of its sentiment ontology to provide you with a more accurate sentiment analysis. It is available as an on-premise tool or as a SaaS and comes with support for Linux and Windows platforms. Daniel Soper Sentiment Analyzer is an online tool for general sentiment analysis. It is an automated tool that makes use of text analysis and computational linguistics to determine the overall sentiment of a written piece of text. This tool only works with texts written in English since it was developed using a large database of different genres of English transcripts as well as written samples of conversations which were archived in American National Corpus. It calculates the sentiment score of the entire text and assigns it a value of either negative or positive. Daniel Soper’s Sentiment Analyzer is a free tool. CloudCherry is a real-time SaaS based customer experience monitoring platform with a built-in sentiment analysis tool. It uses unstructured data from multiple sources such as emails, comments, and tweets thus providing robust sentiment analysis of customer’s feedback. CloudCherry’s sentiment analysis engine relies on three technologies—CloudCherry’s Proprietary Algorithm, IBM Watson Message Sentiment, and Azure ML. Its ability to monitor data in real-time enables companies to immediately plan and carry out new strategies to rectify the issues causing customers to give negative feedback. It gives five different values of sentiments ranging from strong negative to strong positive. It also supports multiple languages such as English, Portuguese, Spanish, Korean, Mandarin, and Arabic to name a few. You can request a demo to see the product in action. SSIX Sentiment Analysis is a sentiment analysis tool that is built specifically for small to medium-sized enterprises (SME). It determines the overall sentiment of a piece of text by first assigning a value of positive, negative or neutral to the words in the text and a score to the strength of these sentiment values in the given text. Then, it calculates the overall sentiment of the text. It is a multilingual sentiment analysis tool that provides sentiment analysis in real-time, and can also provide sentiment analysis of data covering a specified period. SSIX comes with an interactive dashboard for displaying the sentiments. An API for SSIX Sentiment Analysis is also available. SentiStrength is an automated tool for extracting sentiment from web-based texts. It determines the sentiment of a piece of text using lexical algorithms. It is an approach which involves using words with predefined sentiment value to assign sentiment values to the words of a text that is being analyzed and then calculating the overall sentiment of the text. SentiStrength assigns sentiment values in three different scales—positive and negative; positive, negative and neutral; and from -4 to 4. It also assigns a strength value to the sentiment on two different scales which are -1 to -5 (for negative sentiments) with -1 being not negative and -5 being extremely negative, and the second scale is 1 to 5 (for positive sentiments) with 1 being not positive and 5 being extremely positive. SentiStrength was basically built for English but it also has support for other languages. Multiple versions of SentiStrength are available. Academics can use it in their research for free. A paid Java, Windows and online version is also available for commercial use with price starting at 1000GBP. Brandwatch is a social media analytics platform with built-in sentiment analysis used for monitoring mentions and conversations about your brand or product. It relies on a rules-based approach for determining sentiments and assigns a value of positive or negative to the sentiment. It offers real-time monitoring of multiple online sources such as Facebook, Twitter, blogs, News, forums, and videos. This enables companies to monitor the changing opinion of customers towards their product and to develop new strategies if the previous ones are getting negative feedback. Brandwatch also offers insights comparing the value or image of your company to that of your competitors. You can request pricing for their different plans and a demo. Cision sentiment analysis provides sentiment by monitoring conversations and mentions around your brand, campaign, and product on social media in real-time. It makes use of natural language processing and its own proprietary sentiment analysis algorithm to determine sentiments. And then assigns a value of positive, negative or neutral to the sentiments. The real-time monitoring feature of Cision sentiment analysis tool enables companies to address negative user feedback quickly and to take steps to amend the cause of the negative sentiments. Patterns and trends of the customer can be determined by going over the sentiment of their feedback. You can request a demo and pricing of the product. Lexalytics’ Semantria Sentiment Analysis API is a cloud based sentiment analysis tool. Semantria employs a dictionary of words or a phrase-value pair system where the value of a sentiment could be in the ranges of -1 to 1. It then uses this dictionary to perform sentiment analysis first at entity or phrase level and then assign it a score depending on the sentiment of the phrase. These individual scores are then used to calculate the overall sentiment score of the sentence using a process called lexical chaining. One of the notable features of Semantria API is that in order to increase the accuracy of the sentiment analysis, it takes its analysis further to paragraph and entity level. It comes with support for multiple languages such as English, French, German, Portuguese, Spanish, and Mandarin. A complete list of supported languages and other features can found on their website. A free trial and demo are available upon request. Brand24 is a social media monitoring tool with built-in sentiment analysis designed for small to medium-sized enterprises who want to monitor customer feedback and conversations around their products or brand. It provides automated sentiment analysis of the mentions of your product or brand and assigns them values of either positive, negative or neutral. It monitors multiple online sources such as websites and social networks in real-time. This enables companies to address and fix the issues of customers who are providing negative feedback before it gets out of hand. Indico provides a real-time sentiment analysis API that makes use of deep learning models for sentiment analysis. The API works with text from multiple online sources such as tweets, email, forums, and blogs. It assigns a score of 0 for negative sentiment and a score of 1 for positive sentiment. It considers a score of 0.5 a neutral sentiment. Indico’s sentiment analysis API boasts of being faster than its competitors, with the ability to analyze lots of documents within milliseconds. It supports a number of different languages such as English, Chinese, German, Spanish, French, and Italian to name a few. Indico is available in two plans. One for enterprises and one for individual or small scale users. Details of these plans can be viewed at their website. AYLIEN provides a text analytics API with built-in sentiment analysis. It uses machine learning and artificial intelligence to determine the overall sentiment of a document and assigns it a sentiment value of positive or negative. AYLIEN sentiment analysis can also determine the subjectivity of a piece of text that is whether the text is objective or subjective. A number of pricing plans are available with the minimum starting from $49/month. A free version of the API is also available which has a limit of 1000 calls/day. AYLIEN also provides a demo of the API. MeaningCloud sentiment analysis API is an automated solution used for determining the sentiment of mentions or conversations on social media, and reviews of products written by customers on forums. It utilizes computational linguistics, natural language processing, and text analytics in determining sentiments. It has the ability to provide sentiment analysis on a document as well as an aspect-based level for greater accuracy. After analysis, it assigns a value of positive, negative or neutral to sentiments. MeaningCloud gives you the option of defining your own dictionaries or adding new elements to the dictionary. It also enables you to determine the subjectivity or objectivity of a piece of text and comes with support for multiple languages. The API can be tried for free after creating an account. Multiple plans are available. Sentigem is an English-based sentiment analysis tool used for analyzing documents or blocks of text. It is currently in beta phase. Sentigem boasts of providing fast automated sentiment analysis of texts that can be thousands of characters long. It calculates the overall sentiment of the text and assigns it a value of positive, negative or neutral. You can access the functions of the API using the RESTful interface of Sentigem sentiment analysis API. In order to work with the API, you need a key which you can get upon request. Opendover is a web service that provides automated sentiment analysis through its sentiment analysis API. It uses its semantic technology which comprises a vast knowledge base of words and opinions (from opinion texts) to determine the sentiment of a piece of text. It assigns a score of +1 to +5 for positive sentiments and a score of -1 to -5 for negative sentiments. You can use the Opendover sentiment analysis API on blogs, websites and content management systems to incorporate sentiment. A demo is available on their website. You can also request an API key. It comes with different pricing plans. Bitext provides an API for determining the sentiment of conversations and mentions of your product, brand or company. In order to ensure greater accuracy, it makes use of deep linguistic analysis and Bitext’s own parsing technology for determining sentiments. This enables it to perform sentiment analysis at sentence level as well as phrase level. One of the notable features of the Bitext API is that it not only provides the overall sentiment of a sentence but also shows the different types of sentiments that are available in it. Entity based sentiment analysis is also possible. Apart from assigning a sentiment score of positive or negative, it provides a value for the strength of the sentiment. It comes with support for multiple languages including English, Spanish, French, Portuguese, Italian, German, Dutch and Catalan. Bitext allows you to use the API for free upon signing-up, but with a limit of 0.5 MB. You will have to update your subscription through the Bitext dashboard or contact Bitext in order to increase your usage. The Lymbix sentiment analysis tool performs sentiment analysis on text-based online sources such as emails and tweets. Lymbix uses natural language processing and crowdsourcing to develop its knowledge base and lexicon in order to ensure greater accuracy. It assigns a value of positive or negative to sentiments. It also provides a RESTful API which developers can incorporate into their own applications. Pricing and demo are available upon request. Repustate is a text analytics engine with built-in sentiment analysis that uses machine learning algorithms for determining the sentiment. It complements these machine learning algorithms further by employing other techniques such as part-of-speech (POS) tagging and lemmatization which makes the sentiment analysis process more efficient. In the POS technique, a sentence is broken down into its grammatical parts such as verb, adjective, article, noun, and pronoun in order to determine which words will be useful in gauging the sentiment. Lemmatization is the process through which Repustate determines the original word. These techniques enable Repustate to create a database of words along with their sentiment value. One of the salient features of Repustate sentiment analysis is that it calculates overall sentiment of a document. It also has the ability to extract sentiment at the entity level, enabling it to show the different sentiments that are in a sentence. Repustate also enables you to specify your own sentiment rules in line with your specific needs. It comes with support for multiple languages such as English, Arabic, Chinese, Dutch, Turkish, and Thai to name a few. You can get a demo and a free trial. Different pricing plans are available depending on your needs. Text-Processing provides a sentiment analysis API which uses text analytics and natural language processing to determine sentiments. In order to analyze a text for sentiment, an HTTP POST call is made to the endpoint with from-encoding the text whose sentiment you want to determine. It returns results in JSON format and assigns values of positive, negative or neutral to the overall sentiment of the text. It supports texts in English, Dutch and French. Text-Processing is free to use for non-commercial purposes with a limit of 1000 calls/day. 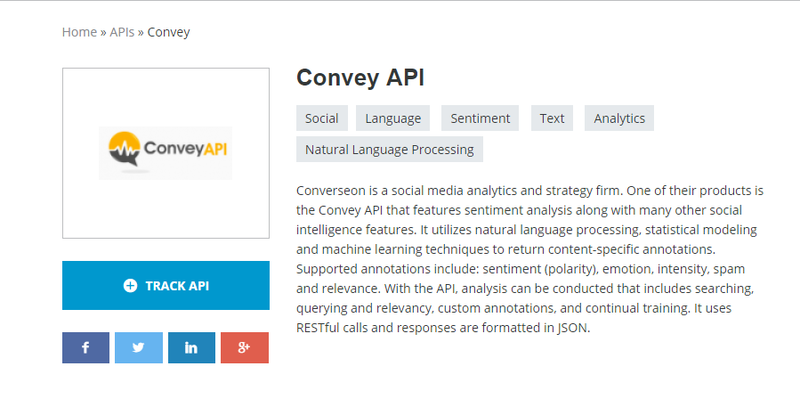 Converseon provides Convey API which is a social media analytics platform that can also perform sentiment analysis. It makes use of computational statistics, natural language processing and machine learning algorithms for gauging sentiments. It then assigns a value of positive or negative to the sentiments. In addition, it can determine the strength of sentiments and the subjectivity of a text. You can access the methods and functions of the API by using the RESTful interface of Convey API. Linguistic Inquiry And Word Count (LIWC) is a text analytic tool which can also provide sentiment analysis. It uses a number of predefined dictionaries and text analysis for determining the sentiment of a piece of text. First, it reads the text and compares the words it encounters with the words in its built-in dictionary and assigns it a value of positive or negative. Then, it calculates the overall sentiment of the document as a percentage. One of the salient features of LIWC is that it can also determine the thinking style, social and psychological states of the text. LIWC is available as an API which you can access after completing a short registration form. Different pricing plans are also available depending on your needs. Enginuity is a social media monitoring tool with built-in sentiment analysis that enables you to monitor the mentions or conversations relating to your product, brand or company on social media. It offers real-time monitoring of a number of social network platforms such as Facebook, Twitter, LinkedIn, Google Plus, Reddit and YouTube to name a few. Enginuity sentiment analysis can determine several emotions including love, joy, hate, confusion, anger, and sarcasm. With Enginuity, you can receive reports via emails. It offers insights regarding your campaigns, changes in patterns as well as new trends. Enginuity offers a 14-day free trial of the product. It comes with two different pricing plans—the Business Plan and the Greatness Plan. Social Opinion is a reputation management and sentiment analysis platform that monitors Twitter for mentions and conversations about you, your products, company or brand. It offers real-time analysis of tweets and is capable of determining the overall sentiment of keywords or topic that you define. Social Opinion assigns a value of negative, positive or neutral to sentiments. It offers insights by monitoring Twitter for customers views on different products and features as well as informs you about the new trends. This tool comes with an intuitive graphical dashboard which visualizes data by making use of bar charts, graphs, and pie charts. Social Opinion offers different pricing plans which you can find on their website. Sentiment Analysis Online is a sentiment analysis API for determining the sentiment of a topic or mention within the context of the document provided. The API is easy to use and you can integrate it into your application. It assigns a value and category to the sentiment. Although it comes with some built-in categories such as neutral, bad, very bad, good, and very good, it offers a feature that allows you to define various categories of sentiment and their values depending on your preferences. It is a free API with a limited number of calls and a key is assigned to you after registration. You can increase the number of API calls you can make by contacting administrators of the website.